Crohnoid - an IBD Journal: OPINION - What should we expect as NHS patients? OPINION - What should we expect as NHS patients? Starting with a blank piece of paper I put down the most important things I require and, where applicable, what I consider to be acceptable timescales. I concentrated on my needs as a hospital outpatient with a chronic illness/multiple chronic conditions because this is a situation of which I have recent, first hand knowledge. (I've excluded GP's, as I very rarely see them, and I'm hoping that hospital stays are few and far between). ...and how does my treatment measure up? Having established the list (and the two aspirations) I thought I'd see how my current treatment measures up against each of them. 1) Appointments are easy to book either on the 'phone or in person. Not all departments are consistent in their approach to routine, six monthly appointments. Some give you the appointment letter there and then; others won't book further than six weeks ahead so I always make a note in my calendar of when I need to make sure I'm on the six week radar. So far (in three years) I haven't had any problems. The longest wait of all was getting a slot to see the Dietician - but I was warned that the demand on that Department is particularly heavy and, for me, it's not exactly a matter of life and death. 2), 3) and 4) The communication with the various consultants has always been excellent. I've never felt I'm being hurried out the door. We always have a full and frank discussion at a level of detail I can cope with. 5) Co-ordination works well. Letters and emails are always copied between the three main consultants and there is a MDM (Multi Disciplinary Meeting) were patients with multiple conditions are discussed. 6) I've always received prompt responses to my emails. If I have a question that I think may have implications across disciplines then I copy it accordingly. 7) I did have one particular issue with follow-up letters from one particular department but a simple email to the Head of Department sorted that out. It's all resolved now and we're back on track. 9) Mostly pretty good. My last Haematology appointment started 15 minutes early! There have been occasions where the clinics are running late but nobody kept the patient patients informed. The new Outpatients Dept. at St.Thomas' has large screens all around the waiting area and these carry messages if any clinics are running more than 30 minutes late. 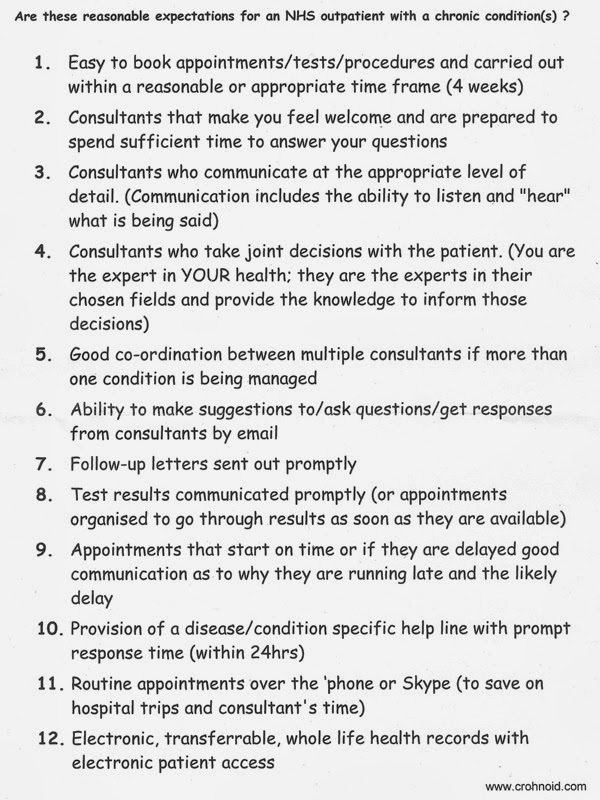 10) I've only had reason to contact the IBD and Stoma helplines. Both have replied very quickly. When I had a problem with my stoma I was able to go and see one of the nurses that lunchtime. 11) This is more an aspiration than something I think will happen in the very near future. I don't know at what level the decision can be taken to implement it - individual consultant; Department; Hospital Trust; or from the NHS on high. 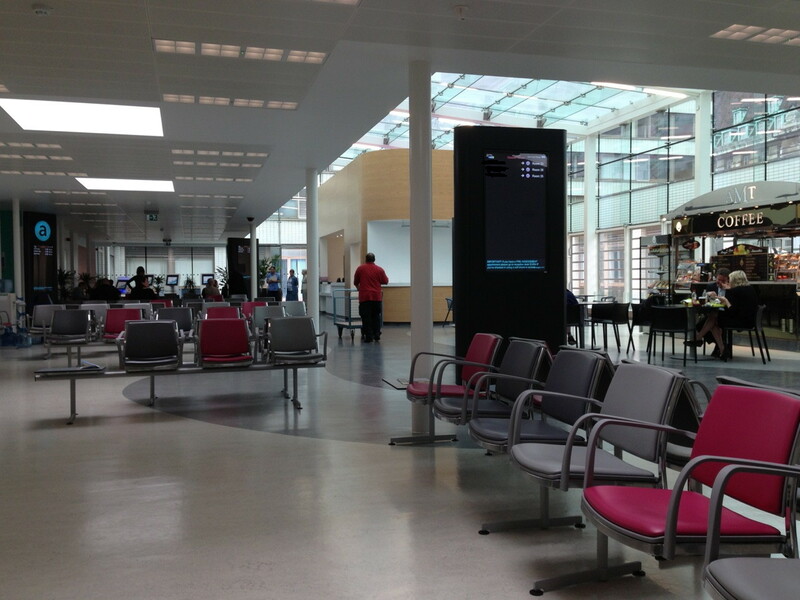 I'm very impressed with the treatment I receive from the NHS at GSTT. If I had to give them a score, judged on the first ten items, it would be 9 out of 10. I have had the odd hiccup along the way but by taking an active role in managing my treatment they have quickly been sorted out and never caused a problem.